Lead nurturing requires a personal touch. Like Josh says, it is not about adding the first name and last name over and over again. You have attracted good leads. Now, you have to keep these leads happy while at the same time, gently push them through the buyer’s journey and create conversions. When your sales cycle is long (which happens in most B2B cases), it is not always that easy. You cannot afford to dish out anything to your leads and expect them to be convinced. In a longer sales cycle, you need relevant marketing messages that align with your leads’ interests and needs. It is more about knowing your leads real-time and accordingly nurturing them. Hence, capturing lead information like name, social profiles, demographics, and firmographics has become so important. Brands are turning to tools like LeadFuze to capture information that will help in building a buyer’s persona. Once you have built a buyer’s person (a semi-fictional replica of your actual customer outlining the possible interests and needs), you need automated behaviour-based drip marketing campaigns for an effective lead nurturing process. Drip marketing campaigns refer to a series of marketing messages that are triggered by pre-set behavioural actions of your leads. These are highly personalized and trigger maximum engagement. Typically, a drip campaign refers to a series of marketing messages sent out to a list of subscribers. However, lead nurturing requires a more personalised effort. It is not about sending a series of marketing messages; it is about understanding whether a lead will benefit from your marketing message and whether that message will trigger engagement. Advanced lead nurturing campaigns include automated drip campaigns, but these campaigns are triggered based on lead behaviour and dynamic segmentation. Dynamic segmentation refers to segmenting leads based on their behaviour. A lead behaviour continues to change throughout the buyer’s cycle. To understand which lead is moving down the marketing funnel, you can assign lead scores. However, you can have a scenario where two leads exhibit similar total scores, but they will not engage with the same type of marketing message. To understand the difference, you need to look at the browsing pathway. It can be that one of the two leads spent a majority time browsing your pricing page and feature pages. The other lead may have just browsed through all the pages, leading to a similar total score. But it is evident that the former lead is closer to getting converted than the latter. Lead nurturing practices require a lot of monitoring and tracking accompanied with efficient lead management. Each lead takes up a different path and reacts differently to your marketing efforts. So, the typical drip marketing has now evolved into behaviour-based lead nurturing drip marketing. Drip campaigns designed for lead nurturing are highly personalised. Leads are segmented based on their demographics, firmographics, in-app and website behaviour, and stages of the buyer’s cycle. Based on these factors (and more), drip campaigns are automatically triggered. It is wrong to believe that drip campaigns benefit only the marketers. It is equally beneficial for the sales team. I can say this because the whole thing goes back to the “mandatory” marketing-sales alignment concept even before you start thinking about implementing automation. It is a fact that not all leads engage in the same way. Some are pretty active, while others are too reluctant to take note of your emails. Whatever it is, email campaigns continue to be the most preferred communication channel. Although marketers are adopting multi-channel marketing, emails still take the limelight. Hence, automated email drips are a mandate to nurture leads. When you sign up or subscribe to a platform, immediately you receive a welcome email. It consists of your first name (which is now very common in almost any email campaign), a short welcome message, an overview of the kind of experience you will have with the brand, and a small milestone to begin with. The email will mostly be signed off either by the CEO/founder or maybe the marketing person. Whoever it is, you will instantly know it is a real person (avoiding spam folders or worse). This helps in building a bond with the brand. You keep receiving emails from this same person which creates an online-relationship. Later, when this person actually gives you a call, you can instantly relate. Below is one such welcome email from Smart Insights that one of my colleagues had received. 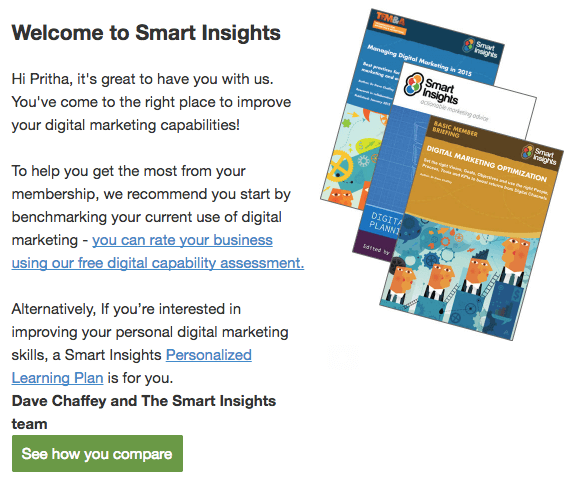 If you look closely, it instantly tells you how Smart Insights will help you in ‘improving your digital marketing capabilities’. To get things rolling, Smart Insights offers a customized recommendation and also an “alternative”. Everyone wants to know their competitive ranking, which is why the green CTA with “See how you compare” words strikes the perfect chord. Welcome emails are usually followed by onboarding emails. Onboarding email drips are designed to help you get acquainted with the brand and its various resources. These emails are based on behaviour-tracking, because often you might receive emails helping you pick up from the exact point where you got stuck while using the product/services. 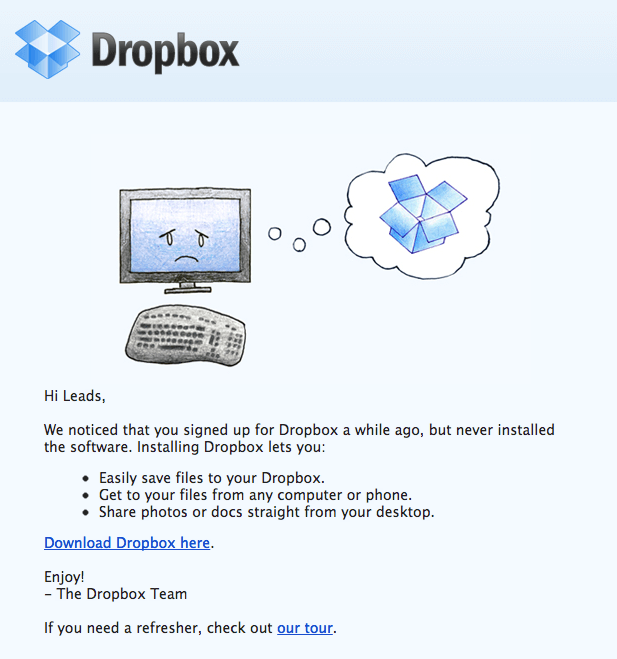 Check this onboarding email from Dropbox. This email can also be tagged as a re-engagement email. It tries to nudge users to download the desktop version of Dropbox while simultaneously telling the benefits of doing so. The clean design template of Dropbox is my favourite kind here. Another favourite is this email from Canva, a designing platform. I received this email while I was designing wedding cards for my own wedding. I continuously looked for wedding card templates and kept editing quite a few number of them. And then I woke up to this email that clearly tracked my activities and sent me some handy tips. My friends say it’s simply because it was wedding season around; I prefer to be logical! This is fairly popular. I’m sure you have tons of emails announcing various promo codes and seasonal offers. Owing to the Christmas spirit, I’m sure you have already received multiple Halloween, Black-Friday, Christmas, and New Year promotional offers. PS: Many find promotional emails annoying. I hated it when I received discounts after I upgraded to a premium plan of a particular landing page building tool. It was annoying. Also, emails that are clustered with images and bright colours hurt eyes. Pro Tip: Ensure you are sending your promo emails to people who will engage with the same. It makes no point to send a huge discount offer to someone who has already paid for that same service/product. Also, nicely designed emails aligning to your brand proposition and the season work well. For instance, look at this email from Urban Ladder. Oh! That lovely way of saying a Christmas Story. The story is about how ‘Grinch’ stole Urban Ladder’s furniture and what happened next. This is by far the best Christmas Promotional Email I have received. It may be long, but emails like this make you read the whole story and also check the offers (which is the main purpose of this email). Yet, look at the way they connect with the Christmas Spirit. These emails are solely targeted towards educating and creating a brand awareness after a visitor subscribes or signs up (usually designed for bulk sending). However, certain lead behaviour is taken into consideration while segmenting leads for these emails. Some leads might require basic educational information about the brand, while others might engage with a more narrowed down content piece. For instance, when you sign up with a brand, you receive emails on overall industry aspects. Slowly as you start engaging, your email content narrows down as per your interests. As more time passes and you start using the brand/upgrade to a premium version, you get emails that are industry related and are also concentrated on how better you can use that tool/services for better results. You must have some leads that were once very active, but suddenly stopped engaging? To trigger engagement, you need to know why they stopped being active in the first place. Maybe they did not get what they expected. Or maybe the content in your last email was not aligned to their interests. In such cases, creating a re-engagement drip campaign often helps in rekindling old connections in a smarter way. You can conduct an A/B test with a handful of leads before you send to the entire list. Imagine you opt for a premium plan of an automation tool. Your payment is done, your amount is deducted from your account, but you still haven’t received an email confirmation about the same. Yep, it’s frustrating and your anxiety will soar up high in no time. Transactional emails based on lead activity help in relieving your leads from these anxieties. Although I don’t see this as a marketing drip campaign, many-a-times, you need to have these emails scheduled properly. Welcome to Cross Drip Marketing! I’m sure you will agree that whenever someone talks or writes about drip marketing, the entire focus is concentrated over drip email campaigns. Well, I am not against it, but there is another kind of drip marketing that people talk less or discuss separately. I am talking about push drip campaigns. Push notification campaigns are my favourite. I agree that emails have a great one-to-one communication feeling, but push notifications are much more personalized. It sits silently without disturbing you or forcing you to take a look. Yet, thanks to the prevalent use of dynamic content in these notification campaigns, push messages are highly eye-catching. These are short and crisp, accompanied by a short link that will not require you to visit the website or launch the app. If you have built a drip campaign on Aritic PinPoint or other platforms, you will know how easy it is to build a drip campaign. You can create cross drip campaigns as well. Aritic PinPoint offers multi-channel marketing. You can run an email drip, push drip, and an SMS campaign together. Based on lead behaviour, score, and activities from each campaign, you can trigger another campaign. Let’s say you create a drip email campaign for leads that upgrade to a premium plan from free trial. When they finish the purchase, you send an email. If they leave mid-way, you automatically bucket these leads for two campaigns — you send a push notification urging them to opt for the premium plan and avail certain benefits instantly. You provide a link directly for completing the process. This message is followed by another email after two days urging for the same action but in a more elaborate way. This way, you can cross drip multiple campaigns across many channels. Like I said, using dynamic content within push messages has increased the credibility of this marketing channel. You can choose to turn off all push notifications on your phone or from your browser settings. By using dynamic content, you can show your leads same message in various ways. For instance, multiple language support helps in showing your message in local language based on your lead’s location. Or, the same offer is shown to two leads in two different ways based on buying pattern. Consumers are pretty conscious these days. You cannot feed them any random information and expect them to engage. Your leads have ample information at hand, all thanks to the internet that’s a gamut of information. Hence, centering all marketing strategies on lead behaviour and lead engagement is the root to getting more conversions. If you are not tracking and connecting with your leads on a emotional level, they will ditch you in no time. By emotional connection, I am not saying you start exchanging poems over SMS (one of my colleagues did think this to be a viable way!!!). Every brand has a unique proposition that solves a particular pain point. All you need to do is grasp that painful chord and suggest an easy solution for the same. When you know what your leads want, it becomes easier to draft marketing messages. And with the right kind of message, your lead nurturing drip campaigns will stir engagement and create higher conversions. What are some strategies you use for lead nurturing? Let us know in the comments! Ankit is a technology entrepreneur at Aritic - full stack automation software platform for digital business at Aritic with Marketing Automation, sales CRM, Transactional Mail, and Desk.